This revolutionary tool will allow you to warp your images thanks to an algorithm which makes your pixels elastic ! We have a reed surrounded by grass. Once the Warp tool is activated, the image is surrounded by a grid of small blue squares. Move your cursor one of these squares, it will turn into another blue square. You will then be able to warp your drawing from this angle. Have fun playing this elasticity ! You will notice that the possibilities are nearly endless, but your drawing maintains some integrity. 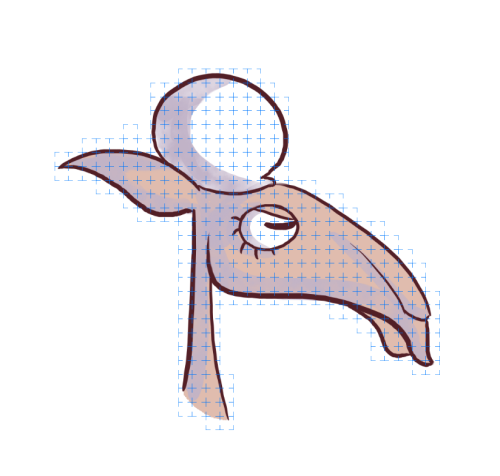 Holding Ctrl lets you move the entire drawing integrally. Apply : once satisfied by the settings, this button can finalize the operation (you can also use the [Enter] shortcut). Reset : allows you to go back to the original drawing, unless you clicked on Apply. The Undo function will only apply to this tool after Applying. Source : allows you to choose between the current image or look for an image stored in the Library. 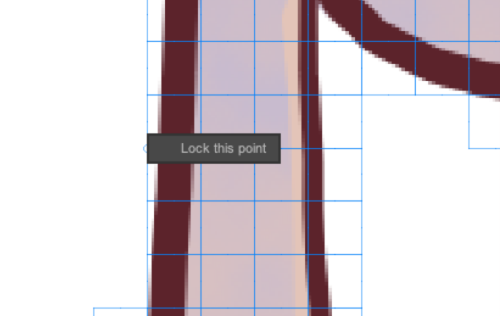 1) Current image : this option is ideal to correct an image’s little flaws. However, applying the deformation too often may corrupt your image. 2) From Library : this option is accessible via the sub-menu. It is ideal to animate without quality loss. But you will need to store images in the project’s Library beforehand. Once you select this option in Source, the Library will open. Double click on the image you wish to import. By always having the same source, you will be sure to work on an image that will not be altered by several manipulations. It is even recommended to create a second point to have a better anchoring on the left and the right of the line. Once these pins locked, we will be able to move the ear by having minimal interaction on the stalk. 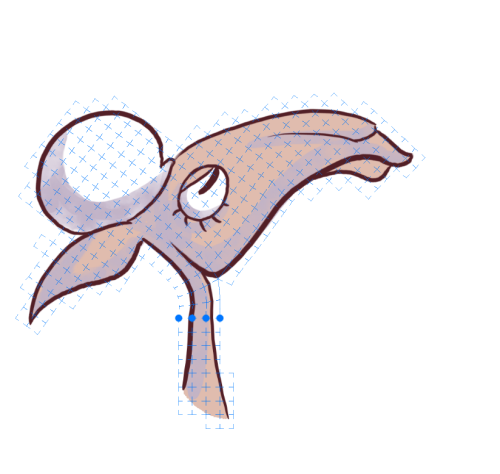 If you create two more pins, you will be able to move the ear without any interaction with the stalk, or vice-versa. Clicking on Reset will go back to the original drawing, but will also delete the pins. Rigidity : gives a value (between 1 and 100) to your image’s elasticity. Size : will allow you to modify your image’s size with a percentage value. Square size : based on the value, the squares’ size will be more or less large (from 4 to 100). The smaller the squares, the more the warping will be precise, but will also be slower to interact with. If your computer is not powerful enough, applying this function will be slowed even more by too many detailed parameters. The larger the squares, the less precise the warping will be. It will be faster to compute, but you will be much more limited in the warping possibilities. Grid Color : this function allows you to change the grid’s (i.e. the squares) color. You need to click on the little blue (by default) square to get a picker. You will then be able to look for another color in the Color Panel or in the software’s interface. The adjacent value (50% by default) allows you to modify this grid’s opacity. Continuous calculation : If activated, the tool will compute the grid rigidity continuously while you're not using it. You will find some balance in your drawing. When the result suits you, uncheck the function to deactivate it and stop computing. 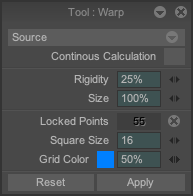 The Warp tool does not have a reset button, you need to manually change the parameters to go back to the default ones.